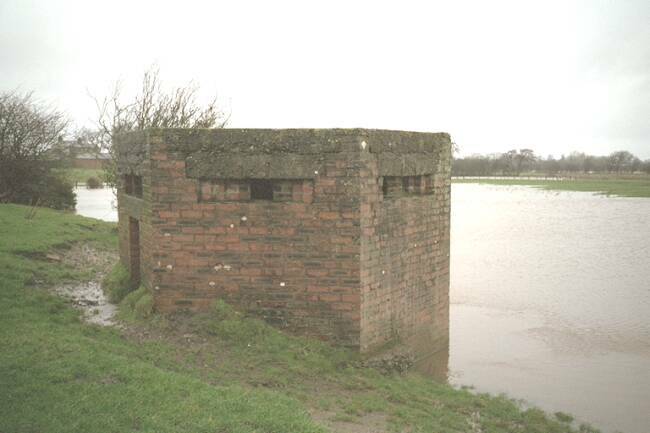 Standing guard over the Wampool flood plain, these classic type 22 pill-boxes form a group of emplacements arranged along the eastern side of the aerodrome. 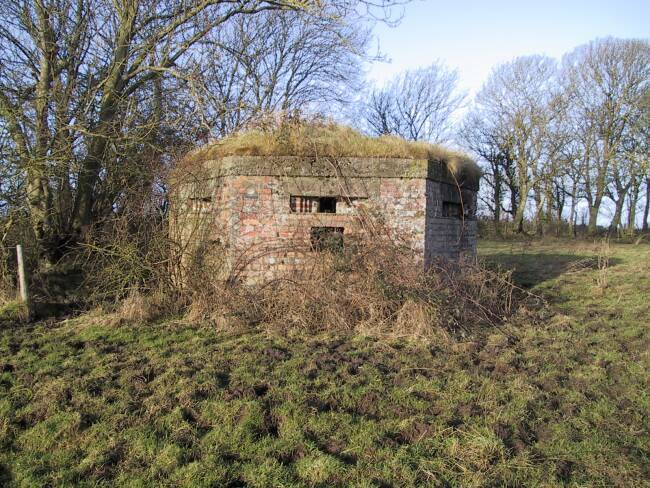 A further pill-box is sited westwards on the other side of the Kirkbride road, adjacent to the guard-house. The pill-boxes featured here are all located near Black House Farm on the eastern side of the Wigton-Kirkbride road, near to the aerodrome entrance. Kirkbride aerodrome was planned as an Aircraft Storage Unit in 1938. In 1939, No:12 Maintenance Unit was formed, remaining active until closure of the aerodrome in 1960. In 1943, the runways at Kirkbride aerodrome were extended to allow Liberators to land. Other aircraft popular here at that time were Mitchell bombers, Wellingtons, Halifaxes and Bostons. 1944 saw the arrival of Vultee Vengeances and Albemarles. In the mid-1980's, the framework of an Albemarle was discovered in a disused quarry at Hayton, near Aspatria. I seem to recall it being excitedly gathered up and sent to the Imperial War Museum! Click on the minatures above to view the exterior of the pill-box. Note the interesting hole beneath the embrasure which looks away from the aerodrome, most probably to take a 'Boys' Anti-Tank rifle. 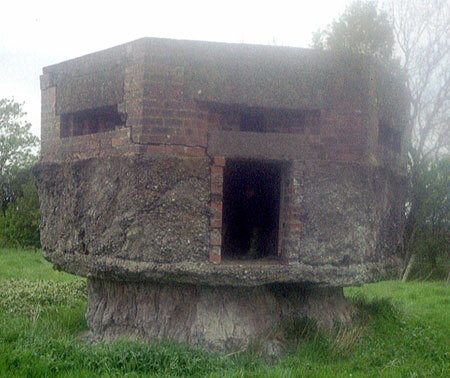 The third pill-box adjacent to the guard-house also features an aperture identical to this one. A closer look at the inside can be found below. These pill-boxes are in a relatively out-of-the-way location, and have not been disturbed much. This one still sports the turnbull M/G mount, with vertical adjustment handle! I am curious to know about the other mount, a loop of iron with holes in it. It is attached to the embrasure which faces the aerodrome. This well-constructed and fortified pill-box has the typical "Y" profile anti-richochet wall inside. The pill-boxes were found to be quite clean inside, and were not occupied by animals, as many are. This pill-box has a straight anti-richochet wall, angled at about 45° from the front loophole. It is also fitted out with Turnbull mounts, although just the embrasure surrounds remain. The only "artifacts" discovered in this one were a small spring-frame, like a bed-frame, and an ammunition box! (empty....) - It has written on the side: "303 BALL Mk7". I am indebted to all who wrote to me regarding the markings on the ammunition box. It would seem that it contained the sort of .303 calibre bullets fired from a Lee-Enfield rifle or a Bren-gun, and that they were formed on a bandolier. I am told that the "Mark" number suggests a post-war issue, and can only surmise that either box was left there following some sort of military excercise, or that the pill-boxes were manned after the war. I understand that Kirkbride aerodrome was guarded not only against the Nazis, but against the IRA too! The type F/W22 pill-box to the left is adjacent to a 'Lamella' blister-hangar used as a fertiliser store, near Powhill. Approaching it from the north, one is faced with a large ditch which has been revetted with wooden beams and boards. This ditch may have been either an anti-tank arrangement, or a means of augmenting the field-drainage, ensuring the aerodrome did not flood. There were no 'Turnbull' mounts left inside, just steel frames around the loopholes where they would have been fitted. An anti-ricochet wall was present, as in the other pill-boxes here. Identical in every respect to the first pillbox shown on this page, this building is to be found just on the edge of the Wedholme Flow, a peat-marsh now categorised as a 'Site of Special Scientific Interest' (SSSI). It guards the southern edge of the aerodrome, and is equipped to take an anti-tank rifle.